Following months of public engagement, the province is moving forward with legislation that would manage legalized cannabis in Alberta with health and safety top of mind. Minister Ganley announces Bill 26 with Ken Kobly and Jeff Mooij. The proposed legislation, An Act to Control and Regulate Cannabis, involves amendments to the Gaming and Liquor Act , which would be renamed the Gaming, Liquor and Cannabis Act. These amendments would include many of the details outlined in the Alberta Cannabis Framework, released in October. An Act to Control and Regulate Cannabis would also allow for two kinds of cannabis retail sales in Alberta: privately operated physical retail locations and government-operated online retail. The Alberta Gaming and Liquor Commission would be responsible for oversight of private retail, and details on licensing will be available early next year. Set the minimum age for purchase and use at 18. Establish provincial offences for anyone under 18 who possesses five grams or less of cannabis. Give AGLC the mandate to oversee distribution, compliance and enforcement of the cannabis retail system in Alberta. Establish authority to set regulatory guidelines and licence requirements for private cannabis retailers. Ban co-location of cannabis sales with alcohol, pharmaceuticals and tobacco sales. Establish restrictions around where cannabis can be smoked and vaped in public. Establish authority to further regulate advertising, labelling, and promotion of cannabis if required after federal regulations are established. Additional aspects of the Alberta Cannabis Framework – such as details around drug-impaired driving, taxation and workplace safety – will be empowered through updates to other pieces of legislation before July 2018. 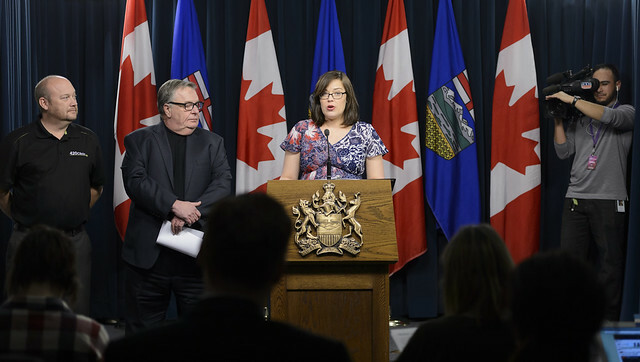 Between June and October, the government heard from more than 60,000 Albertans who provided input that guided the Alberta Cannabis Framework. More than 100 organizations also shared their feedback and expertise. Full details of the proposed legislation and engagement results are available online.